Sample some of CAO's finest blends incorporating premium tobaccos from around the globe. The CAO World Sampler Features handmade smokes from CAO's highly-rated America, Brazilia, Italia, and Criollo cigar lines, all of which are sure to satisfy. This well-rounded sampler pack unites four unique flavor profiles in one slick package, making it an excellent cigar gift for any aficionado. Contains one of each: CAO Brazilia Gol! (5"x56), CAO America Potomac (5"x56), CAO Criollo Pato (4.7"x50), and CAO Italia Ciao (5"x56). I am not a big fan of the sampler. My favorites. The best sampler pack ever. All 4 cigars are different but equally enjoyable. It's a staple in my cigar purchases. This CAO sampler was outstanding! My friends really liked them. I am a Nub fan so I was smoking Nub and they smoked these. From what they said---these are great cigars. All I had expected/hoped for. Great balance, draw and a good looking cigar. If your having a bad day this smoke will have a positive impact! Great group of smokes at a good price. A fine little collection of CAO's finest Robusto sized cigars. I like this four pack so much I have ordered it a few times. Great way to sample and have a variety to share. This sample pack offers the smoker a chance to try out a few of CAO's line. Well worth the price for five decent sticks. For CAO this is a great way to sample some of their wares, and great flavors as you expect from CAO. Well worth the mone. and take your time with these. Great afternoon evening smoke. This CAO sampler packs is a great buy! Four very nice cigars for less than $20. These cigars sell fo4 $7-9 in at any cigar shop you go to. They all smoke very well with great flavor. The America has a 92 rating & has a nice earthy spice flavor with mid to bold strength. 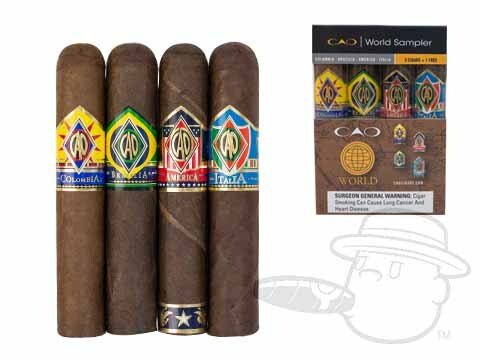 CAO World Sampler is rated 4.3 out of 5 based on 35 customer ratings.